Following EQMM’s busiest week of the year—the last week in April/first week in May, when the Mystery Writers of America holds its Edgar Allan Poe Awards banquet in New York, and immediately thereafter the Malice Domestic Convention in Bethesda, Maryland begins—what I most savor is the quiet of my garden. It needs a lot of work by the time I get back, but the silence of it after five days of partying and entertaining is restorative. Prior to the Edgars each year, Dell Magazines gives a cocktail party at which we present the EQMM Readers Awards and honor our Edgar Allan Poe Award nominees. The celebrations this year were overshadowed a little by the need of two of the authors we’d very much hoped to see—one an Edgar nominee (Trina Corey) and one a Readers Award winner (Doug Allyn)—to cancel their trips to New York. But we had a great time with those who did manage to make it—and that included one of the Readers Award winners, Marilyn Todd, who traveled with her husband Kevin all the way from Cognac, France for the events; Readers Award winner Dave Zeltserman, who was in New York from Boston for a week with his wife Judy; and Edgar Award nominee Tim L. Williams who’d suffered a serious spinal injury just two weeks earlier but still made the trip (in a neck brace) from Kentucky with his wife Sherraine and kids Carson and Madelyn. The old friends we caught up with and the new people we met at the Edgars events are too numerous to name, but there are some photos at the end of this post where you might see some of the authors you know or read. When I arrived at the Malice convention I discovered that my first appointment was scheduled for the same time Texas pharmacist Luci Zahray, otherwise known as “The Poison Lady,” was giving one of her talks about household and garden poisons suitable for perpetrating the perfect murder—in fiction, of course. This year her talk focused on plants (though she also has extensive knowledge of metals and chemical poisons), which I’m always interested to know about, and I’d certainly have attended had the timing been different. I read in a recent interview of Luci Zahray by Kate Flora that oleander is one of the most toxic of garden plants, all parts of it being deadly, and three leaves enough to kill a man. I had plants on my mind all through the Malice Convention not only because my garden awaited at home, but because Art Taylor’s March/April 2103 EQMM story “The Care and Feeding of Houseplants” was nominated for the convention’s Agatha Award for best short story. And it won! (Congratulations, Art!) The story, as I’m sure everyone can guess from the title, involves plant poisons, but also a lot more, which I’ll get to in a minute. Due to the extraordinarily long and harsh winter this year, gardening is just getting going in many parts of the country. Normally, daffodils have flowered and gone up where I live by the time Edgar Awards week arrives. This year there are a few still in bloom even now. I imagine this disruption of the season will make its way somehow into this year’s crop of gardening mysteries. Though I like to garden, I tend not to pick up gardening mysteries at novel-length very often; that’s probably because those I read at short-story length don’t surprise often enough. A freshly turned garden bed is obviously an inviting place for disposal of a corpse, and almost any garden provides the poisonous means of ensuring that there’s a corpse to dispose of in the first place. If you doubt that, just do a little research on the plants in your garden. A favorite ground cover of mine, lily of the valley, is a highly poisonous plant for humans. If swallowed even in small amounts, all parts of this delicately white-flowered perennial are poisonous, and it can be fatal if consumed in large quantities. According to a source I found, dose yourself (or someone else) with lily of the valley and you’ll suffer abdominal pain, vomiting, and reduced heart rate. On the other hand, this most innocent looking of plants can also be used as an antidote to poison, because of its ability to reduce an accelerated heart rate. I was at a plant sale this past weekend with a friend who picked up a tray of lily of the valley and became alarmed when I mentioned its poisonous qualities—wondering if it could kill a dog. It can, but of course, absent human agency, a dog is extremely unlikely to ingest it. A multitude of other poisons are to be found in my garden or nearby, so I imagine you’ve got them in your vicinity too: the bulbs of daffodils, and of the hyacinth that bloomed here last month can cause vomiting and diarrhea, and prove fatal. Foxglove, in large amounts, causes dangerously irregular heartbeat and pulse, digestive upset, and mental confusion. All parts of the laurel, rhododendron, and azalea plants are also fatal in the right quantities, producing depression, difficulty breathing, and sometimes coma. And let’s not forget the cherry tree, of both the wild and cultivated varieties. Even the twigs and foliage of my “Cherry Pie Tree,” apparently, contain “a compound that releases cyanide when eaten”; “. . . gasping, excitement, and prostration” are the common results (according to Aggie Horticulture). Be careful with any rhubarb pies you prepare, too, because consuming that plant’s leaves is known to cause convulsions, coma, and a speedy death. I could easily go on; it just takes a quick bit of Googling to get this kind of information. But that, in a way, is my point. Someone who comes up with a poison we don’t know about, and an inventive way to use it, is part way to a good mystery. But it’s hard to come up with something little known, and even a truly ingenious method of murder is only part of the trick. A garden mystery, like any other mystery, has also got to provide an interesting motive for murder and intriguing characters. And that’s what makes Art Taylor’s Agatha winning story so good. I honestly can’t remember what plant poison was used in that tale, but I recall vividly all the characters involved and the tensions arising from their interactions, which, of course, provide the motive for murder. This entry was posted in Awards, Business, Conventions, Writers. Bookmark the permalink. Congratulations to all the winners! Thank you for the wonderful party, and enjoy the flowers, Janet. It was a great gathering and lots of fun. 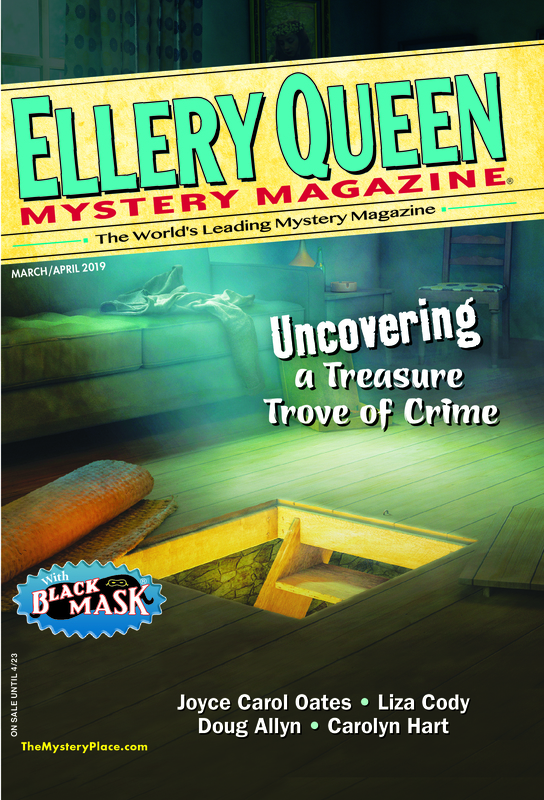 Congrats again to the EQMM Readers Award winners, and especially to my friend, Art Taylor, for capturing the Agatha! Thanks Janet, Jackie, and all who contributed. Great seeing you and linda and Jackie and all the other wonderful writers and literary folks I am so privileged to associate with at these terrific gatherings. Have a great spring. Best from Joanne and I.